Corel have released AfterShot Pro 2, the second version of their Raw conversion tool and is now laden down with 64-bit compatibility for super fast Raw conversion, HDR tools, updated Raw profiles as well as enhanced existing features such as easier batch processing, coping with larger images as well as a workspace overhaul. AfterShot Pro 2 costs £57.99 with a 30 day money back guarantee. You can also trial the software for 30 days. The 142Mb file that we downloaded from the Corel website took us a while to download, but we are running off a 512Mb broadband system. Once downloaded, actually installing the system took just 4 minutes, although that doesn't include reading through the terms and conditions. AfterShot is essentially Corel's answer to Adobe's Lightroom, ACDSee's Pro series or any other of the many “lite” editing suites there are out there. 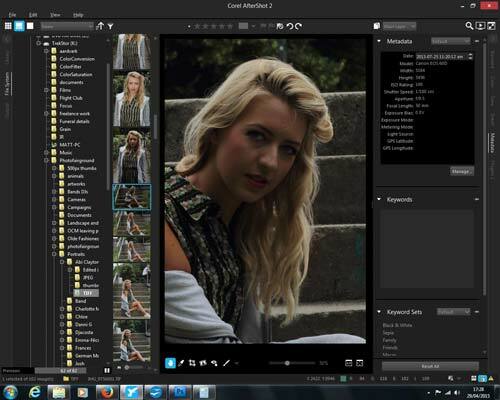 These suites are designed for viewing, tagging, fast conversion of Raw files and light editing. 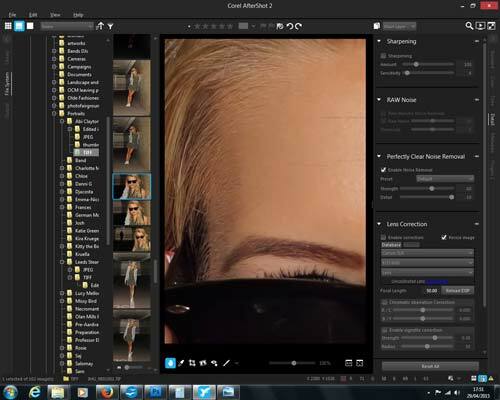 Heavy image manipulation, such as cloning and the like, can be done in a full editing suite, such as Paint Shop Pro or Adobe Photoshop. Once you've either launched the trial or entered the serial key after purchase, the main workspace will open up. It has a very simplistic approach to it and as long as it works, it shouldn't really matter. Plus, you won't get logos or fancy graphics getting in the way of your pictures. The main window is split into three sections. The left side is for managing the workflow of your pictures. You can access the hard drive or memory flash drives via the File System tab which is down the side of the panel. There's also an Output tab for batch processing and this can be accessed through the File tab at the top. The Library will start to fill up as you use the program more and allocate your photographs depending on the metadata you've input or you can create Catalogs of images to have instant access to them. There are also three different viewing options and how the central panel will look depends on which one you prefer from the choice of thumbnails, preview with thumbnails down the side or just the main preview image. The default is the mixture of the two and we found that easier to use as we tested the program. With each image, you can contribute to the metadata catalog information by giving it a star rating, a colour label or a flag as a pick via the buttons across the top. 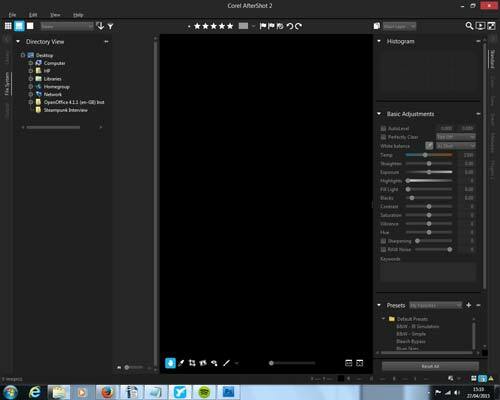 To the right of the window is a similar layout to many editing programs. A histogram gives exposure information in RGB as well as average, then below there's a Basic Adjustments option for such things as White-balance, Colour temperature and exposure variances as well as Saturation, Vibrance and Hue. You can also sharpen the image and adjust the noise of a Raw image. Just like the Catalog section having tabs down the side, the Adjustments section does too. These essentially allow you to make more indepth changes to the Basic adjustment options. You can choose from Colour, Tone, Detail and Metadata. There's also an option for Plug ins. 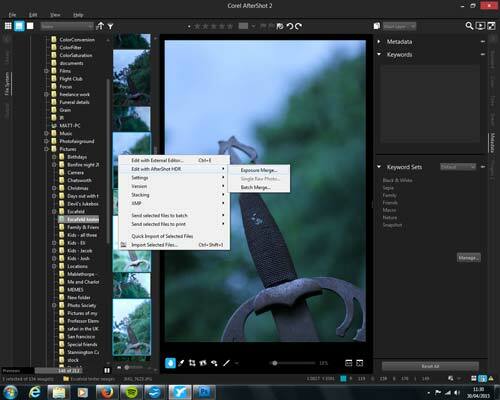 AfterShot 2 sees a number of additional features added to it from version 1. The Catalogs that we mentioned previously have been expanded to 20 that can be open at any one time. A big improvement on the one that was allowed before. Improvements have been made to adding layers and there's now noise removal powered by Perfectly Clear. As well as the HDR feature that Corel are trumpeting, you also get a localised Contrast filter and you can change the workspace to how you like it as well as reconfiguring the Output Color Space. Along with some internal upgrades such as Full Multi-Threading and Open CL support, there's also multi-platform compatibility, so Mac and Linux users can join the party. Looking at some of the new features presented in AfterShot Pro 2, the biggest feature that Corel are pushing is the speed of the program. They say it's 30% faster than the nearest rival when converting Raw files and this is attributed to the upgrade from 32bit to 64bit compatibility. We converted our test file of 1Gb of TIFF files to large size JPEGs on a 32bit machine and it took us 53sec. We timed it, but didn't need to because once the conversion was complete, a little notification popped onto the screen telling us how long it took to process as well as a breakdown of the conversion rate per image (2.66sec per image, if you're interested). Interestingly, our review of ACDSee Pro 8 brought up a similar conversion result which shows that if you're running off of 32bit technology, it won't make an iota of difference to other programs. 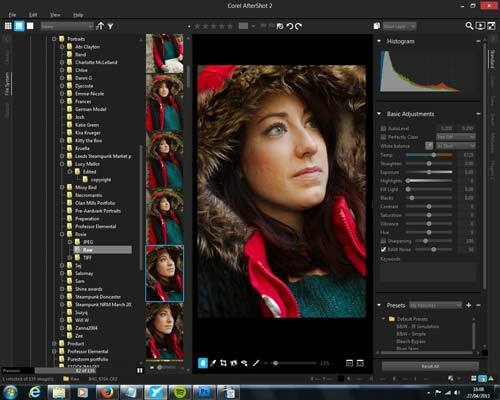 Editing images is a breeze and a heck of a lot faster with it all being on one screen. It's easy to get caught up in the Lightroom workflow as being the easiest, but that's not necessarily the case and AfterShot Pro 2 proves that point. We managed to edit pictures in a few seconds that we'd normally have to skip through various pages editing bit by bit. The features are precise in their execution and there are some handy little bits in there that – while not exclusive – can help you complete your work faster, such as the Straighten feature which rotates the image without the need to select it from a drop down menu. Saving files is fast with single images saving to JPEG from TIFF in under a second. Just be careful if you're renaming images in the program, because you have to click through to another section to rename it and it's easy to forget when it's not in front of you. You will get a reminder about over-writing, but who needs that every five minutes? There are three different HDR options. 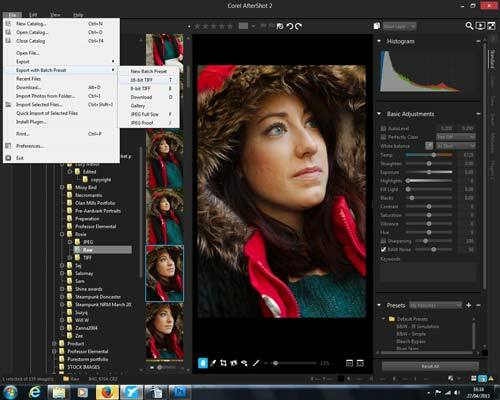 You can Exposure Merge which is the most commonly used type of HDR merging. You select a few photographs of various exposures and merge them together to get a balanced exposure. There's a Batch Merge option for when you have lots of the same image with multiple bracketing results. You can also simulate HDR with a single Raw image. You can't do it on JPEG because of it being a lossy file and will have already not recorded enough information when taking the picture. There are a number of Response Curve profiles you can choose from depending on the type of camera that you took the pictures on. A simple one button approach to alignment with an auto crop we found is very precise. 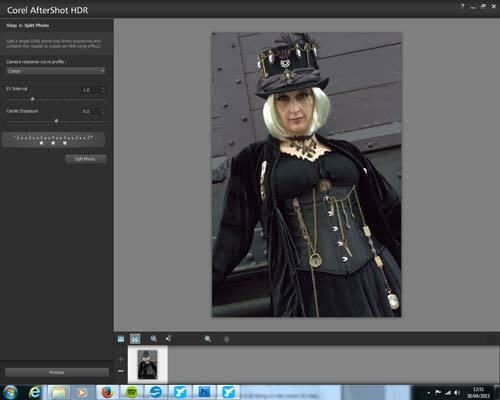 You can also touch up various layers by selectively erasing parts of the image. Simply turn off the Preview button at the bottom, choose the layer you want to adjust and use the Brush out option to remove the part of the image. It will come up in red where it's deleted. Using the single image HDR mode only processes Raw images. It won't even do TIFF. The steps are very simple; you choose the camera profile, select the exposure bracketing EV steps and the centre exposure. For example, if the picture is a third of a stop too bright, you can knock down the centre exposure by a third of a stop, then the Interval will work off that setting. Once you're ready click Split photo and three thumbnails will appear at the bottom of the window. Once they've processed and you're happy, click Process (which will appear as if by magic) and a new window will open with some editing options including some presets for your image. We had a sceptical approach to AfterShot Pro 2 because of Paint Shop Pro's tendency to be slow on processing changes to images. However, the lightning fast speeds that they're proud of is most certainly real and true. An average full 16Gb card of photographs can be processed in around a quarter of an hour which is less than the time it takes to have a cup of tea and biscuit. Gone are the days of sitting back and relaxing while your computer grinds through hours of conversions. It's 30% faster at 64bit as well, which would bring that amount down to around 10 minutes. Most of the other Raw converter programs have copied Lightroom with the workflow, so it's refreshing to see one that is more original. We like the one page layout, it seems to have everything there infront of your face instead of having to flick through pages. Most importantly, the price is astonishingly good value. At around 50% cheaper than Lightroom 6 and 25% cheaper than ACDSee Pro 8, it just goes to show that you don't have to always go the way of the big guys and pay through the nose for your editing gear. If you're looking for a basic editing work flow program similar to Lightroom, then AfterShot Pro 2 is a very good option. We found it easy to navigate, quick to download and fast at processing photographs. In a time where speed is of the essence, that's what really counts, isn't it?